The spring migration is winding down in these last weeks of May. The end-of-season migrants like vireos and flycatchers are more in evidence now than the wood warblers, and most of the warblers we’re still encountering have likely taken up residence on the island. Some of the Yellow Warblers nesting at Fish Point have been captured four or five times now. We know of one nest where the female is currently incubating. Semipalmated Plover, Olive-sided Flycatcher, and Acadian Flycatcher were the three new species recorded for the spring. This season, we’ve now encountered all of southern Ontario’s commonly occurring tyrant flycatchers. Five species of Empidonax flycatchers (neither Willow nor Alder has been individually confirmed, but we’ve had multiple Traill’s Flycatchers, the former specific name when both birds were considered one species) as well as Eastern Wood-Pewee, Great Crested Flycatcher, Olive-sided Flycatcher and Eastern Kingbird were all recorded in the last ten days. The Eastern Phoebes have all since moved on. Our one Acadian Flycatcher gave its loud, emphatic song on the morning of the 29th. Depending on your inclination, or perhaps your flycatcher’s local dialect, it says “flee-sick,” “tee-chup,” “spit a KEET,” “peet-sah,” “pizz-ah,” “pan-za-ROT-ti,” “deep-DISH,” or even “chek-pleeze.” This may owe more to the invention of the transliterating observer than to the actual repertory of Acadian Flycatchers, but they do have a dawn song that is quite different from their territorial song. The Mosquito Bay mosquitoes have emerged. They don’t add up to hordes yet, but there are more than enough to generate considerable frustration when one is trying to focus on extracting a bird from a net. Even with the last of the migrants still moving through, we’re beginning to see fledglings appear from the early nesters, like American Robin and Canada Goose. 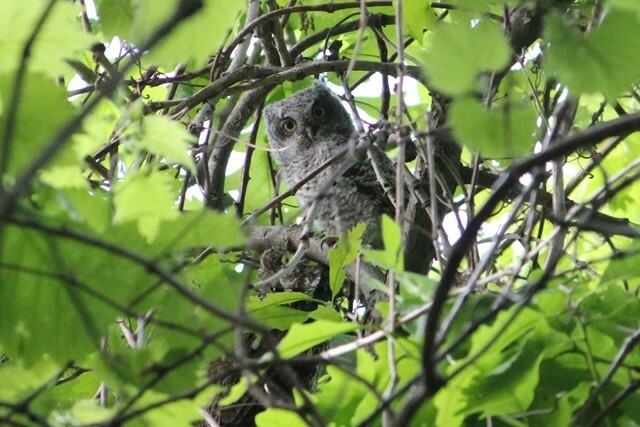 We’ve got a family of Eastern Screech Owls hanging around the nets. There are three very downy young that take it in turns to nap, often sitting in grape vine tangles like the one pictured above. The first chick appeared on the 26th, just before dawn, sitting on a log across the path and was very nearly stepped on. The owlet and the groggy bander, both rather taken aback, had a staring contest before one of the parent owls began dive bombing the intruder. The female owl would have begun incubating in late March, as the egg and nestling stages each last about a month for the Screech Owl. On the 30th, the Cuckoos (another relatively late migrant), both Black and Yellow-billed, were demonstrating why PIBO has a cuckoo for its logo. They’re in full breeding mode and were not only singing away, but were frequently visible, and we even managed to catch one of the black-bills. Cuckoos are known as very secretive birds, so it was nice to have good looks at so many of them.